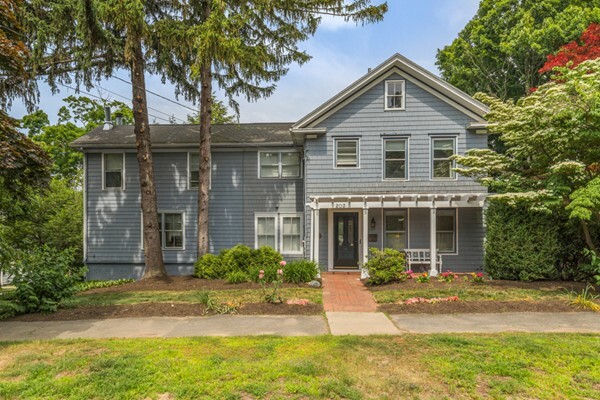 Charming Farmhouse style home within walking distance of Town Center, Schools, Commuter Rail, Middlesex Fells Reservations, and amenities! This bright and sunny property offers many features that are sure to appeal to today's buyers: beautifully remodeled kitchen with granite counter tops & stainless appliances, generous master bedroom suite with a fireplace and ensuite bath, a home office/study on the 2nd floor, 3 full bathrooms, Central AC, tasteful lighting, lovely hardwood floors, 1st floor laundry, ample closets, and much more. The 4th bedroom/Family Room on the 1st floor adds flexibility of living arrangements. The landscaped backyard, front porch, and 1-car attached garage complete the setting for this picturesque property located on a large corner lot. Convenient access to the highways allows for ease of commuting.